The Nigerian Army has recalled over 2,500 soldiers who were asked to withdraw from service for alleged offences committed under the counter-insurgency operations code named Operation Zaman Lafiya. The review panel set up by the Army, which began sitting in Kaduna on August 17, has also screened and reinstated 102 officers, who were sentenced or facing prosecution in relation to the operations in the North-East. The reinstated soldiers and officers, it was learnt, had commenced retraining at the Nigerian Army Training Centre, Kontangora, Niger State. The 2,500 soldiers were among the over 4,000 who responded to a memo from the Army authorities inviting soldiers for a review of recent disciplinary cases, which emanated from the counter terrorism operations. Our correspondent learnt that more dismissed personnel of the Army might be brought back to the service as the screening panel would continue with the review of cases on Monday (today). A source in the Nigerian Army, who confided in our correspondent, said, “The panel has cleared 2,500 soldiers who were dismissed from their units for minor offences alleged to have been committed under Operation Zaman Lafiya. The soldiers, who were said to have been conveyed out of the NDA, Kaduna, venue of the review panel, in luxury buses on Saturday are expected to undergo a short retraining exercise as part of the reintegration requirements into the service at the NATRAC, Kotangora. After the retraining, the Army authorities would screen the affected personnel and re-activate their suspended bank accounts. It was further learnt that the panel would also review the cases of 66 soldiers who were sentenced to death by firing squad. The source, who spoke to one of our correspondents on Sunday, said that not all the dismissed soldiers who turned up in Kaduna were lucky to have regained their jobs. Some of the soldiers, said to have been dismissed about 15 years ago for various offences, were asked to leave the venue of the review panel. The soldiers were said to have been dismissed from the Army for various offences since the regime of former President Olusegun Obasanjo.It was learnt that majority of the affected soldiers were dismissed from the service for violating a law said to have forbidden the personnel of the Army from marrying foreigners. When our correspondent contacted the Acting Director, Army Public Relations, Col. Sani Usman, he said that those asked to leave the venue of the review panel were not eligible for the review exercise. Usman said that they were dismissed from the service for various offences about 15 years ago and were not part of those whose cases were meant for review. 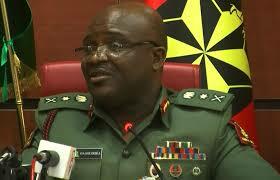 He said, “The alleged protesting soldiers were no longer soldiers for almost 15 years now. “They were dismissed for various offences and therefore are not part of those whose disciplinary cases are being reviewed by the committee. Consequently, they are not eligible for the ongoing review. On the issue of the recall of the officers and men of the Army, he said that he could not give the figure of those screened and cleared. Usman said that the exercise was ongoing and that the panel was expected to submit its report to relevant authorities. “This is an ongoing exercise; they want to ensure that justice is done. I cannot give you any figure, the authorities are waiting for the committee’s report; they will conclude sitting very soon,” he added.